Members of the Ogdensburg Free Academy Key Club won top honors at the Albany Leadership Training Conference they attended recently. They are, from left, in front, Secretary-elect Olivia Berghaus, President Noelle Dutch, Lt. Governor Hailley Webber, Vice President-elect Alex Pinkerton, Cody Fifield, Webmaster Rheanna Cameron, MacKenzie Spicer, Kiwanis Advisor James E. Reagen; back, Treasurer-elect Sloane Ryan, President-elect Anton Skamperle, Faculty Advisor of the Year Christina Frank and Nevaeh Lockwood. 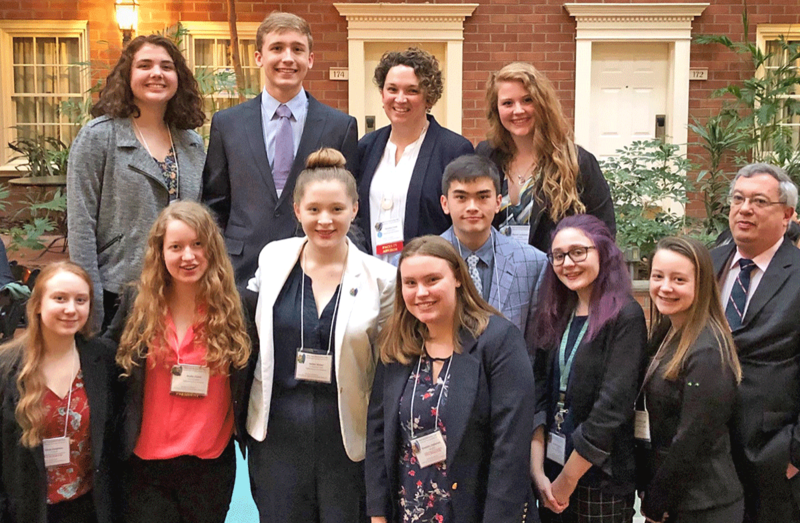 OGDENSBURG -- The Ogdensburg Free Academy Key Club won top honors at the New York State Leadership Training Conference in Albany over the March 30-31 weekend with 15 awards for community service and leadership. The Ogdensburg high school service club was awarded for having one of the top student community service programs in New York State, with its Read and Lead project at the Ogdensburg Boys and Girls Club. The Ogdensburg Kiwanis Club was awarded the Steven R. Scharoff Single Service Award for the best service project of any club of any size. Attended by more than 750 students from over 200 Key Clubs across the state, the annual conference provides leadership training workshops to develop student-led community service and awards. Faculty Advisor Christina Frank was honored for her 14 years of service to the club and its students. "Christina Frank has been a tireless worker for our young people since she joined the faculty at OFA," said Ogdensburg Kiwanis Advisor James E. Reagen. "We have been extraordinarily lucky to have her donating her time to help our children. Our state organization wanted to add its thanks because she will be moving to Madill Elementary School in September where she will assume new duties as its building principal. I was pleased many of our students and past alumni spoke up about how her efforts had an impact on their lives." • Outstanding Club President Noelle Dutch, a junior at OFA, who earned top honors for leading the student organization. • Special service awards were also presented to Noelle Dutch, Rheana Cameron, and Nick LaCombe. OFA Junior Hailley Webber was installed as the new Lt. Governor, representing St. Lawrence and Jefferson counties. The OFA Key Club is sponsored by the Ogdensburg Kiwanis Club which is hosting a pancake and sausage breakfast on Saturday April 6 from 8 a.m. to 11 a.m. at the Salvation Army at the corner of Green and Franklin Streets. Tickets are $8. Children under five eat free.